Most of our members reside in Southeastern Massachusetts and Rhode Island. We’re educated and responsible practitioners of our sport and have a deep respect and appreciation for the great outdoors. We’ve created a club that will appeal to all levels and skill of vehicle build and driver ability. We want to attract like-minded families from our area and throughout New England who share our vision of fair and balanced public land access and management. Our approach begins with mentoring our youth with regard to respecting the rights of private landowners and abiding by State Law. We continue by enlightening the public, and supporting our communities’ clubs and associations initiatives. We’re proud of this club, its membership and their accomplishments. 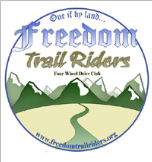 We like to consider ourselves our community’s activists and educators& and want to pass these legacies on to our kids… so we’ve called this club Freedom TrailRiders.